The popularity of poker on cable television and the resulting boom in interest in tournament style Texas Hold'Em has led to better than ever sales of cheap poker chips as a much younger cohort has taken to poker in recent years. On the downside, many contemporary players have a rather limited knowledge of other poker games. Yes, there is a reason Hold 'Em has emerged as the gold standard game for serious players. 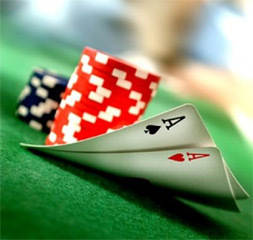 However, it and its close sibling, Omaha, are simply two of a number of outstanding types of poker. While some games commonly played at home have an arguably well deserved reputation for being a bit silly, there are a number of perfectly good, classic games that are very much worth exploring. Below are just three of the best known poker variants. One of the very few games you can find at nearly any card club that is not Hold 'Em, this type of poker begins with an initial deal of two hole (down) cards and one card up. The remaining cards are dealt up, with the exception of the final round (i.e., "the river") and with one round of betting after each card. The best five cards from each hand determine the winner. Because of the greater number of cards being distributed to individual players, fewer people can play the game at once and the lack of communal cards simplifies the strategy. Since players have visual access to several cards from each hand, it is easier to gauge your opponents' hands. At the same time, there is potential for confusion and bluffing based on misleading up cards. You'll see this game in the classic 1960s poker flick with Steve McQueen, "The Cincinnati Kid," but these days it seems to have been forgotten by many serious players. That's a shame because we love it. It starts with a single up card and single hole card and each remaining card is dealt up with a round of betting to go with it. Sweet – and highly deceptive – simplicity. While you can occasionally find Hi-Lo games – which combine low-ball with traditional poker – at card clubs, the purity of this poker game has been all but forgotten, except perhaps by older home players using cheap poker chips. At its simplest, this is a five card game where the usual rules of poker are inverted, with the best hand being what would usually be the absolute worst value hand, often 6-4-3-2-1 of different suits. In lo ball unpaired aces are low and in some versions a "bike," 5-4-3-2-1 of differing suits, is the best hand despite the fact that it would ordinarily be regarded as a straight. This is a particularly exciting game in the five-card version because because a perfect low hand can instantly be devalued or outright ruined by the appearance of a single face card or a pair, hence the nickname "sudden death." If the shoe fits, steal it.